Recently, I’ve been wondering what a one-page football player snapshot might look like. I like one page reports. They’re a good discipline to produce – because you have to discard everything you don’t really need – and they’re a fantastic way to keep a meeting on track. More than a page has people leafing through a document, trying to work stuff out and the discussion starts to break down, but if you can get everything you need onto a single sheet, then you’re in business. If somebody said to me, “do you like this player?”, what would I hand them? I’m a statistician, I can’t just say “good engine, I like him”, there’s got to be some evidence! 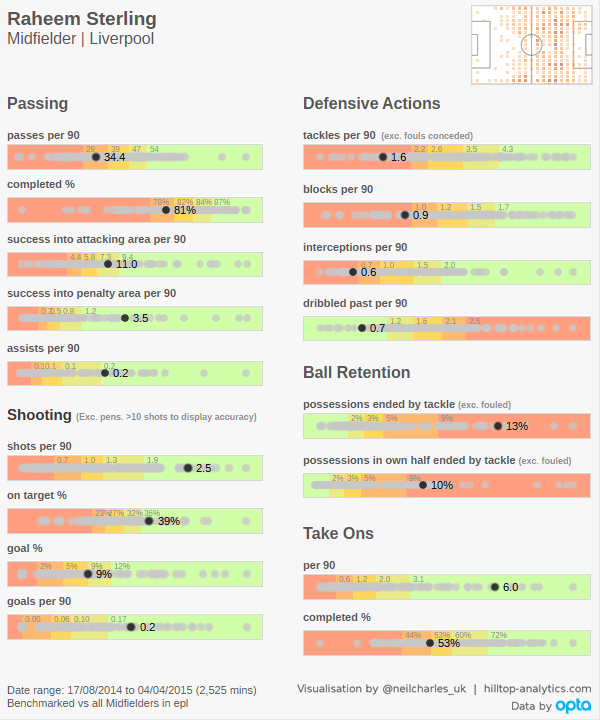 While I was putting this project together, the football blogging community also lost @mixedknuts’ prodigious output of player ‘radars‘, which are very much along the same lines: A quick, visual snapshot of a player’s performances across a single season. Hopefully, these might help to plug that gap. With that in mind, rather than the usual A4 sheet of paper, I’ve tried to design something that will work on-screen as a tweet. On my old blog, I discussed three things for a business data visualisation to communicate. This vis is designed to do the first two jobs and in a future version, might also try to tackle the third. For each metric, the player’s own score is highlighted, against a background of all other players in his position, in the same league. Chart backgrounds are split into quintiles, with a simple red to green shading from worst to best. The report’s quintile split is designed to handle something that I find frustrating when browsing a site like whoscored. You might see a figure of 0.3 assists per 90 minutes, but is that average, above average, or exceptional? Is it above average for a defender? You do get used to what’s a good number, but it’s really handy to have a quick confirmation. Looking at Sterling using the above vis, we can immediately see strong attacking creation and shooting statistics, with low defensive numbers. Passes per 90 are a little below average, raising questions about whether he can become isolated. Ball retention is interesting. Being tackled often isn’t uncommon for a creative attacking midfielder and arguably comes with the territory, but Sterling is also tackled relatively often in his own half. That could be more of a concern. I’ll leave the analysis there, because this post isn’t really about Sterling, it’s about the visualisation. There are going to be quite a few of these coming – keep an eye on Twitter. I plan to get stuck into transfer silly season, especially. Tackles are all tackles, not just ‘successful’ tackles, as per this excellent post by @basstunedtored. This means the numbers might be a bit larger than you’re used to seeing. Player positions are simple defender, midfielder or forward. I plan to improve this in future and properly segment players so that e.g. wingers would be compared only with other wingers. I might add age banding too, to compare a player like Sterling only with other young midfielders. ‘Passes into attacking areas’ are defined as passes that end in a location at least 70% of the way up the pitch. ‘Attacking areas’ excludes the opponent’s 18 yard box, which is split out separately on the report.